The greatest chess player that ever lived. ​Garry Kasparov is a Russian pro-democracy leader, global human-rights activist, business speaker and author, and former world chess champion. He was born on April 13, 1963, in Baku, Azerbaijan (then USSR). He lives in New York City and travels constantly. 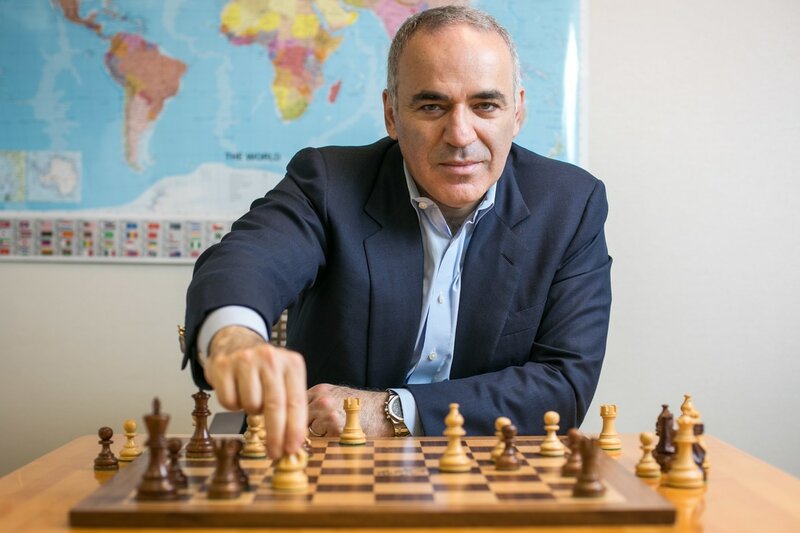 Garry Kasparov has been the highest-rated chess player in the world for over twenty years and is widely considered the greatest chess player that ever lived. As a master of strategy, today he applies the insights and unique perspective from his extraordinary chess career to the issues of leadership, logical thinking, strategy, and success to the speakers circuit and Russian politics. Known as an extremely intuitive chess player, Kasparov also emphasizes intuition's role in achieving one's full potential as an individual and achieving superior performance as the leader of a group or organization. His battles with the super computer "Deep Blue" were worldwide, headline news and he has been at the forefront of innovation in chess for over twenty years. He has been at the cutting-edge of research and the battles between humans and computers from as far back as 1989. His global reach is fed by a steady stream of keynote speaking engagements around the world. His speech topics vary from country to country, but he is never far from what he knows best - strategy and logical thinking. He takes his listeners into the world of calculus, deep thought, the analytical mind, and what constitutes intelligence without reducing the answer to plain black and white. More importantly, Kasparov speeches are customized for every corporation or language group to include local facts and items of interest. Mr. Kasparov is the founder and inspiration behind the Kasparov Chess Foundation, whose mission is to introduce chess into the educational system worldwide. He is a regular contributor to the editorial page of the "Wall Street Journal" and most recently Volume V (Karpov), of his best-selling series of books "My Great Predecessors" was released. Over 100,000 hardcover copies of the series in several languages have been sold - a record for chess. In 2007 his first mainstream book "How Life Imitates Chess" will be released. Mr. Kasparov remains the highest-rated player in the history of chess and the only icon in a game of over 100 million players. On Friday, 11th March, 2005 Kasparov announced his retirement from competitive chess after twenty years as the Number One Ranked Player in the World. Kasparov came to international fame as the youngest world chess champion in history in 1985 at the age of 22. Seeking new challenges, he retired from professional chess in 2005 after a record 20 years as the world’s top-ranked player. Kasparov wasted no time after leaving chess, joking that he would be far busier as a retiree. He quickly became an important voice in the Russian pro-democracy movement against the repressive regime of Vladimir Putin. In 2005 he formed the United Civil Front, of which he is still the chairman, and co-led The Other Russia coalition that focused on uniting the Russian opposition to Putin under the banner of free and fair elections. In 2012 he became the chairman of the NY-based Human Rights Foundation, which is dedicated to protecting dissidents and individual freedom around the world. His latest book is Winter is Coming: Why Vladimir Putin and the Enemies of the Free World must be Stopped. Kasparov also turned his energy to writing and public speaking. “I have spent my life thinking about thinking,” he said, “and I find many others are as interested in the field of improving human performance as I am.” Kasparov’s keynote lectures and seminars on strategic thinking, achieving peak performance, and tech innovation have been acclaimed in dozens of countries. His 2007 book on decision-making, “How Life Imitates Chess” was translated into over 20 languages. The Kasparov Chess Foundation was launched in New York City in 2002 with the purpose of bringing chess into the educational system in the USA and worldwide. Kasparov has long promoted the many benefits of chess for schoolchildren KCF’s program is now used in thousands of schools. KCF formed branches in Europe, Africa, Asia, and Latin America and will continue rapid expansion. Kasparov has traveled to dozens countries to promote scholastic chess programs. ​Kasparov has been a contributing editor to the Wall Street Journal since 1991 and is a regular commentator on politics and human rights. He speaks frequently to business and political audiences around the world on innovation, strategy, individual freedom, and achieving peak mental performance. He is a Senior Visiting Fellow at the Oxford-Martin School with a focus on human-machine collaboration. Kasparov’s book How Life Imitates Chess on decision-making is available in over 20 languages. He is the author of two acclaimed series of chess books, My Great Predecessors and Modern Chess. Forceful, compelling and knowledgeable are words used to describe a speech by Garry Kasparov. Speaking in English he is the new experience on the speaker’s circuit. The subject matter is at your selection and ranges from Strategy, Tactics and Logical Thinking to Politics. His engagements are worldwide and year-round and the average duration is 45 minutes. Unlike some speakers, he derives enjoyment from the Q&A session which can last up to half an hour. A seminar with Garry Kasparov is a unique chance to get hands-on coaching from a man with a lifetime of high-pressure peak performance to share. Ideal for top management and especially for technology companies. Same as keynote speech except that Kasparov is unscripted and dialogue is “off the cuff”. Garry and the interviewer chat for approx. one hour. Subject matter selected by Sponsor. Q&A follows. Questions selected by Moderator. The 90 minutes pass quickly.